This best practice guideline aims to assist nurses working in diverse practice settings provide evidence-based care to adults at risk for suicidal ideation and behaviours. Within the scope of this guideline, adults at risk may include any adult who may exhibit risk factors, with or without expressed suicidal intent. Nurses may interact with these clients in the community, long-term care facilities or in a hospital. Although some approaches presented in this guideline may be applicable to the pediatric client, it is recognized that children and adolescents have special assessment and treatment needs related to developmental stages that are beyond the scope of this guideline. The potential health impact of this guideline is the reduction and prevention of risk for suicidal ideation and behaviours in adults, who receive care from RNs and RPNs, in any setting, thereby contributing to a reduction in suicide rates. The promotion of protection for the individual and families, the enhancement of reasons for living, and the delivery of successful nursing interventions will all reduce the risk for suicide. 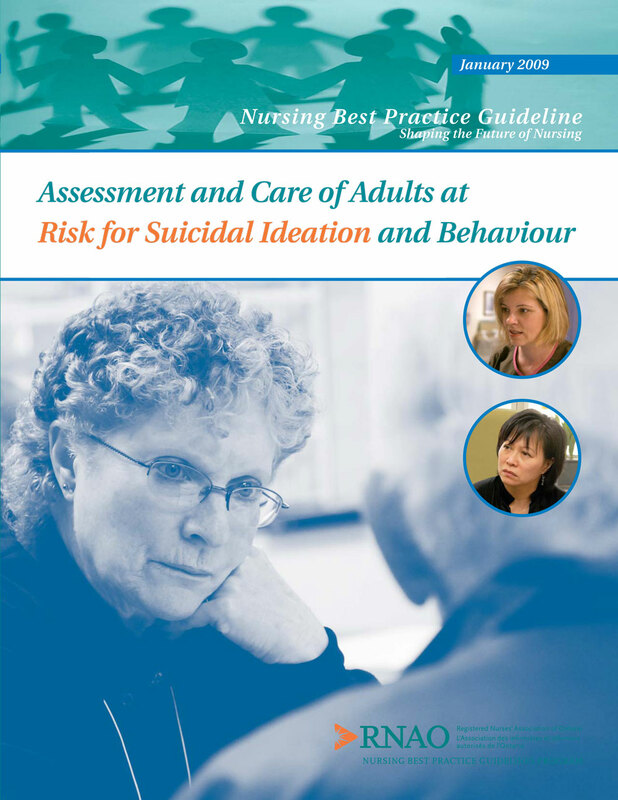 The focus of this guideline is on best practice within the context of the individual nurse-client relationship and so will not address primary prevention interventions that may reduce the risk of suicidal ideation and behaviour. Though nurses play a major role in strengthening communities and advocating for social determinants of health, specific primary prevention strategies in this regard will not be discussed here. Moreover, despite the urgency to address the specific needs of Aboriginal youth population in Canada, the development of participatory, community-based approaches are beyond the scope of this guideline. There are, however, many educational resources and various intervention models that may offer guidance for readers who are interested in the areas not specifically addressed here. Applicability of intervention models may depend on the particular client population, health care professional expertise, or practice setting.